Our legion of followers have been very busy recently, traveling the world, experiencing some of the best snow on offer. Here, guest reporter, Hamish Macphee, gives us the low down on his first trip to Japan, taking in the popular resort of Hakuba and up-and-coming ski area, Madarao (or MadaPOW as it’s known affectionately). Madarao has been hitting the media a lot in 2018, with articles from Powderhounds, Miss Snow it All and the Snow Gauge, to name a few. As a matter of interest, we too visited Madarao in late February 2018 with the kids in tow. Find our review of this fantastic family destination here. So you’ve been hearing a lot about skiing in Japan? There’s good reason for that. You’ve heard about the powder, so light, so dry. You’ve heard about forbidden tree skiing. And yes…..you’ve heard about the snow monkeys. Perhaps you have already done the Canada thing……bloody long flight! You’ve probably tried New Zealand when the Aussie snow is not at it’s peak. The next step has got to be the now famed Japow! 3. Easy public transport Bullet-trains = WOW! 4. 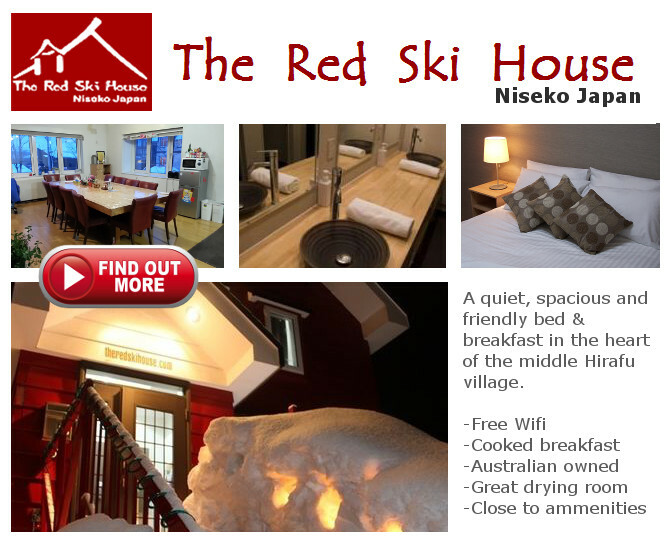 Affordable accommodation walking distance from chairlifts, shops and restaurants. Great food, great people, great ski-schools, beer from vending machines, noodles noodles noodles and a real taste of a very different culture. Oh yeah…and whisky! Now that you’ve decided Japan is for you, the hard choices need to be made. Which resort(s) do you visit? For us there are two great options for the first time trip to Japan’s snowfields: Hakuba or Madarao. If you have the time then, porque no los dos? Give both a try! Access is simple. From Tokyo get the Narita Express from the airport to Tokyo Station for about $50 return $25 for kids 6-11 years old. From Tokyo Station you get the Shinkansen (Bullet Train) to Nagano in approx. 1 hour, or to Iiyama, a short 10-20 mins further along. If Hakuba is your chosen destination then a bus will take you the remaining hour in to the Hakuba Valley and the 9 resorts it has to offer. Goryu, 47, Happo-one (oohhh-ney), Iwatake, Tsugiake, Norikura, Cortina being the larger areas as well as Kashimayari and Jiigatake for the less adventurous. There is so much terrain that you need a month to see everything. Families coming to Hakuba for the first time will love the Goryu/Hakuba47/Iimori area. With ski school at Iimori for the little ones, Hakuba’s best terrain park at 47 and some super groomers at Goryu, this little pocket of the valley represents exceptional value for both money (with the Hakuba Valley Pass) and time with everything so close. For an introduction to tree skiing Hakuba 47 has done it right. Some resorts are known to outlaw tree skiing and take your pass if you are caught in the trees. At 47 they allow it, but safety comes first. In order to access the “tree zones” skiers and boarders need to do a short induction, sign a waiver and collect a bib to be worn over the ski jacket. These bibs are then to be returned by 3pm to the office. Failure to do so will result in a search party being sent out to look for you. There are significant hazards like cliffs and tree-wells so this safety procedure puts the mind at ease somewhat. Just don’t forget to return the bib when you duck in for a quick beer at day’s end! While the youngest is making new mates in ski school and the teenager is honing park skills and progressing to bigger jumps, mum and dad are cruising the groomers and enjoying the breathtaking views of Happo-one and the vast valley below. After lunch and lessons the more advanced in the family might check out some bibs are explore the trees. After the days snow action and perhaps a relaxing onsen Hakuba has many dining options. Booking is highly recommended and waiting for a table is commonplace. For those with the Epic Australia Pass (Perisher) the Hakuba Valley Pass is included. If not, a 7-day (out of 11) ticket will cost about $450 for Adults and $250 for 6 to 12 years old. This pass also includes shuttle bus to any of the 9 resorts. If Madarao is your choice you can get the Shinkansen from Tokyo Station all the way to Iiyama. From the Iiyama station the bus up to the resort (20mins) will cost you less than $10 per person. Madarao is the sleepy cousin of Hakuba. There are many resorts within an hour including Myoko Kogen, Shiga Kogen, and Nozawa Onsen. If you are coming for your first Japanese snow holiday, Madarao and neighbour Tangram Ski Circus (yes, that’s really what they call it) is all you need. At $60 for a day lift ticket for both resorts…what more could you ask for? To say that Madarao was untouched by Aussies would be a lie. The last 10 real-estate acquisitions on the mountain were purchased by Australians…but you wouldn’t know it. Unlike places like Niseko and Hakuba, the Australians have moved in quietly and respectfully. They are creating a family friendly resort that is easy for Australian guests to navigate. We stayed at Aya Lodge. This well renovated guest house offers comfortable rooms and great amenities within few hundred metres of the slopes. The beds are comfy (not always a given in Japan) and the included breakfast goes well above the expected. There are also other great options in the Active Life choice of hotels, Active Life Madarao and Hakken by Active Life (both really kid friendly). Once out on the slopes the resort and it’s network of 15 lifts opens up in front of you. Mt Madarao looms above and attracts great snowfall (Between 10m and 14m per season). On a good vis day views across to Mt Myoko set a magical backdrop…but the foreground is what you come for. Madarao is building a reputation as THE resort for tree skiing. On a day when MadaPOW delivers the goods, there is nowhere else you want to be. The trees at the top of the resort are perfectly spaced and the pitch is perfectly steep to satisfy the cautious thrill seeker. For the daredevils the trees between Madarao and Tangram Ski Circus (known by the seasoners as Tangram Trees) offer untracked lines through steep terrain after the bowls like Powderwave I and II have been skied out. There are gates to enter the tree area between the two resorts and ski patrol are around. Having said that there are many opportunities for those who dare…enough said. If you are very lucky you may come across a Kamoshika or Japanese Serow while skiing the trees. The most accurate description I have heard is that Kamoshika looks like a snow bear goat dog…having seen one myself……I totally agree. But, please keep your distance as they are wild animals. If you need a a few lessons, or are seeking adventure beyond the resort boundary, try Action Snow Sports, run by Aussie Peter Hillman, or Nagano Outdoor Sports run by local legend Aki (who also has a great pizza joint on the slopes). Otherwise, the Active Life Group of Hotels offer complimentary lessons for guests. All offer English speaking instructors. For a short hike the back of Mt Madarao offers endless lines of superb skiing days after the in-bounds pow has been smashed. We recommend the Hotel Tangram for lunch with a great view of just about all the smaller resort has to offer. Plan your next laps while chowing down your ramen or katsu-don. For dinner this small town is bustling with options: burgers at Unjaune, or try the devine Okonomiyaki (Japanese savory pancake) at Sakura. The top of the must-do list for food and drinks in Madarao is the Lazy Yak. This oversized tent (Yurt actually) plays host to a restaurant and bar that also sells and hires snowboards and backcountry equipment. The fried chicken (Karage) is amazing and the tofu is like no tofu you have ever had before. They have a great selection of whisky and some cool gin cocktails, as well as a fine collection of hand-made jewellery…of course. On the way home it is well worth spending few nights exploring the amazing metropolis that is Tokyo. There are endless options for shopping and dining limited only by your budget. For electronics head to Akihabara, Ueno Zoo, or for toys, you cant go past the Hakuhinkan Toy Park in Ginza, a 5 story specialist toy store (the kids will love it). Shibuya Crossing is a right of passage, especially at night. You can give the statue of Hachi the most loyal dog a pat. The Government Building’s South Tower offers amazing views of the city all the way to Mt Fuji on a clear day. The North Tower is not a good. If you want to get a bit closer to Mt Fuji there are tours available with Tokyo Hotel pickup or you can just get the Shinkansen and local train independently. We opted for the guided option and included a tour and tasting at the Hakushu Whisky Distillery. Any whisky drinker will have heard of Suntory’s Hakushu and Yamazaki whiskys. A trip to the serine mountain environment of the Hakushu distillery means the opportunity to sample many different blends like Hibiki up to 30 years old ($30 per 15ml for a $5000 bottle). As well as recognisable labels the tasting room offers samples of the component barrel whiskys that become Hakushu, Yamazaki, and Hibiki. Before leaving home make sure to get your International Driving Permit. Not for a car silly…for a go-cart! Maricar offer tours of Tokyo driving on the roads in go-carts, dressed up in costumes -like Ninja Turtles and Mario characters. This is an experience not for the feint-hearted, but not to be missed. Now is the perfect time to start planning your first trip to Japan. Make 2019 your year of JaPOW. With a little research and some handy Japanese phrases your holiday can be stress-free. 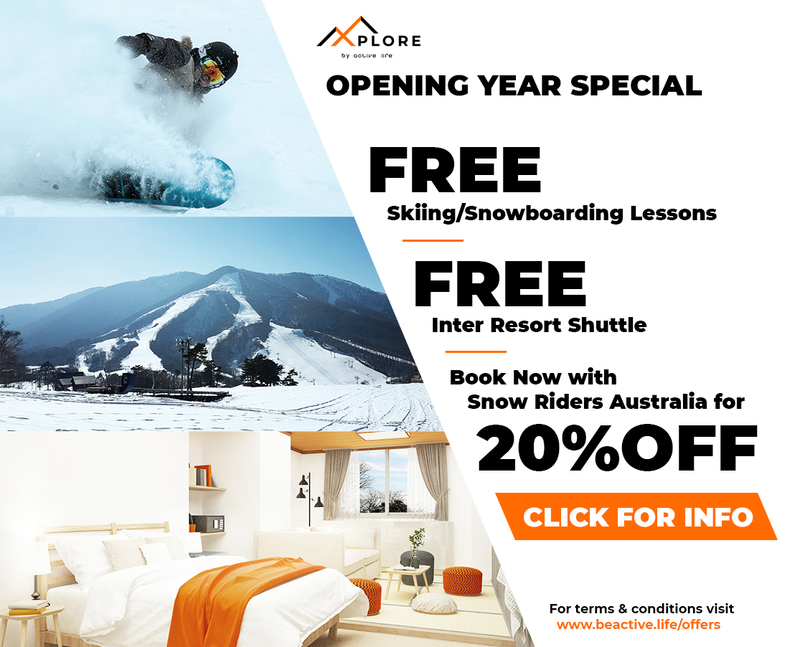 Xplore by Active Life are offering Snowriders Australia followers 20% off accommodation, with no blackout periods. Accommodation includes free lessons and access to a complimentary inter-0resort shuttle bus. PM us for details.